The Ukrainian presidential election has set a new political reality in a large European country, which has for the past six months been going through a most serious political crisis. The interim results of the “Euromaidan revolution” are paradoxical. It has resulted in the collapse of the previous political system and in the loss of territory. But it has not generated new leaders, has not brought about a new political elite. Almost everything has collapsed but the usual oligarchic backbone has survived. 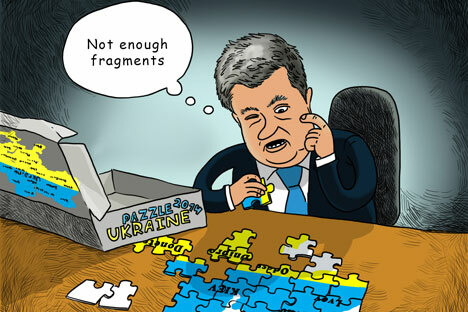 Power is now officially in the hands of one of the most prominent representatives of big business, Petro Poroshenko. Other tycoons, like for example Dnipropetrovsk Region governor, billionaire Igor Kolomoisky, are some of the most influential players. What lies ahead is a fight between financial and industrial tycoons for the country and its economy. The man heading the charge is the shadow master of Donbass, Rinat Akhmetov, who is yet to take on the self-proclaimed “people's republics” in Donetsk and Luhansk for his assets and status. What are the characteristic features of the new situation? From the formal point of view, the legality of the election, which was not held everywhere in the country and took place in an atmosphere far from that of peace and tranquility, can be put into question. The revolutionary drive is waning. People, tired of chaos and unpredictability, have preferred a respectable and sensible boss, who, it is believed, is capable of resolving issues. This is the only thing that can explain the first-round victory for billionaire Poroshenko, a pillar of the very system that Maidan had rebelled against. Petro Poroshenko has an opportunity to distance himself from the interim authorities' failed attempts to restore the country's territorial integrity, be it the loss of Crimea or the transformation of the southeast in to a hotbed of civil war. He can end the “antiterrorist operation” and change the rhetoric, with the nationalistic component, which was water to the mill of the opponents of the new regime, taking the back seat. The majority of the population of Donetsk and Luhansk regions, as of the other parts of Ukraine, yearn for order, peace, and tranquility. Martial law in the Donetsk and Luhansk “people's republics” in response to the events in “the neighbouring country” are unlikely to inspire the local population for long. Therefore, Kiev's opponents in the east should, as soon as possible, organize themselves into a responsible political force, capable of achieving a real, legislatively enshrined, decentralization. East Ukrainian federalists can count on Russia only in the capacity of pro-Russian forces inside Ukraine, but hardly as heads of some unrecognized entities. Moscow is not prepared to take either material or moral responsibility for them. So where does Russia's vital interest lie? In taking part in building a new Ukraine to replace the state that had emerged after the breakup of the Soviet Union and failed to live through a period of political turmoil. Ukraine's participation in Western alliances is seen by Moscow as an unacceptable threat. At the same time, the main trend in Ukrainian politics, especially after the departure of Crimea with its 1.5 million pro-Russian voters, will still be its focus towards the West. It is a reality that Russia cannot change. But if, once it has recovered from the shock, Ukraine's political system once again hits the same path, a new serious conflict of a European scale is inevitable. The only way out consists in institutional guarantees of neutrality, of Ukraine's provisional status. That will require a combination of external and internal levers. On the one hand, the so far chaotic movements of the southeast should be transformed into an effective pro-Russian force, which would become an influential player in Ukrainian politics. Secondly, given how significant the Ukraine issue for European security as a whole is, the new decentralized design should be developed with participation of all the interested outside players. Without agreement from Russia and the European Union, fixed in Ukraine's state system, nothing will work out anyway. This is fully appreciated by realistic politicians in the West, even by “friends” of Russia such as Zbigniew Brzezinski. Ukraine's political culture envisages the possibility of instantly revising any agreement, so it is only a firm external framework that can create conditions to make sure that Ukraine does not yet again turn into a tinderbox for Russian-Western relations. No parallels are ever quite appropriate, but Ukraine needs something along the lines of the Dayton Agreement on Bosnia that was signed in late 1995 between the sides in the civil war under pressure from the USA and Europe and with Russia's participation. This time however, Russia should not just “participate” but be one of the main parties to the agreement. In the case of Ukraine, there is no need for a formal protectorate like in Bosnia and Herzegovina, but there is a need for mechanisms that would ensure that all the interests, external and internal, are taken into account and observed. Now that the election has been a relative success and the West can breathe a sigh of relief and while the “people's republics” still have the moral and political initiative on their side, Moscow should offer a serious deal to Europe and America. And the West would be very rash if, out of the post-Cold War habit, it refuses to agree to compromises and tries to get it all. Fyodor Lukyanov is the chairman of the Council on Foreign and Defence Policy.